Geez, coming up with post titles is HARD work. My fabric has hearts on it, the dress has a little sleeve...and the sleeves on this dress are literally causing me pain (why so tight little sleeves)...hence "heart on my sleeves". It's a leap but let's go there shall we? 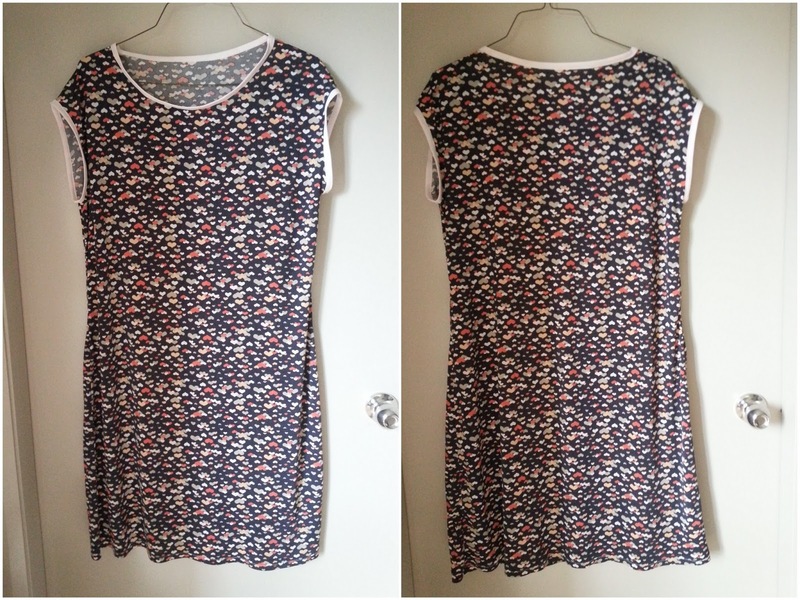 After the success (sort of) of my first Casual Lady Dress I was keen to whip up another one ASAP. 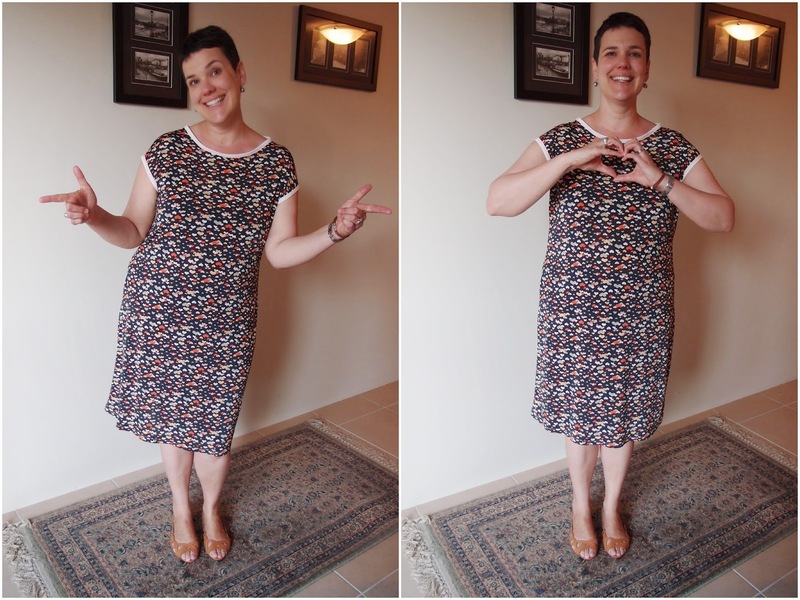 I rushed out to Spotlight that very day and found a GORGEOUS heart print Polyester Elastane. Better still it was on sale and I bought almost all of what was left on the roll. When I was cutting out my first Casual Lady Dress (aka the Giant Sperm Dress) the fabric moved somewhat so I ended up with one WAY too big sleeve and one kinda normal sleeve. Of course in hindsight this means that I didn't actually know what the sleeves were meant to be like on this dress. On top of that for some CRAZY reason this time around I sewed the seam allowance joining the front and back to together at 5/8" rather than the recommended 3/8'...ergo, the sleeves they are TOO small. I think I was trying to make sure that the clear elastic on the shoulders fell well within the seam allowance...because clearly my skin would melt if the elastic touched it...or something. Apart from the Sleeves of Torture I REALLY like this dress. I think the fabric is tres cute and the style really suits me. 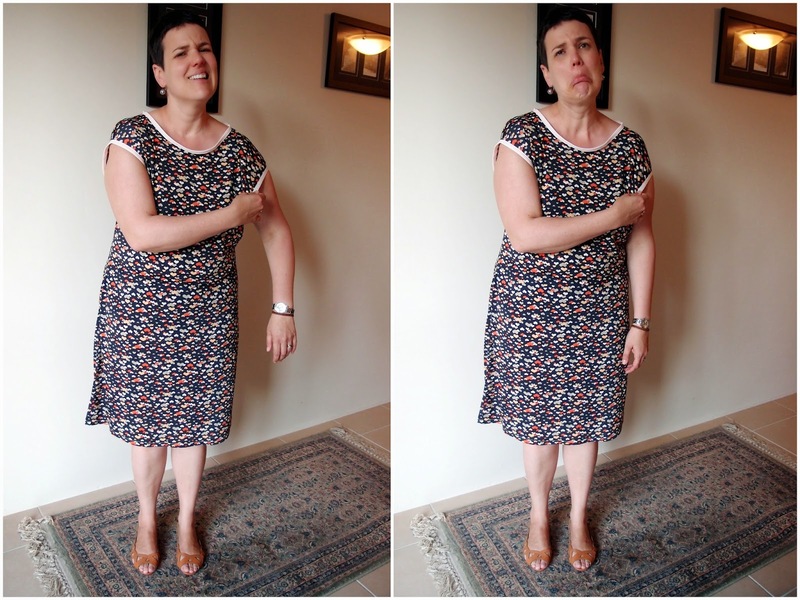 The dress is "curve skimming" without being too tight; and is loose without being sack-like. It's really simple to sew. I think the dress looks quite good from the back possibly helped by how drapey the fabric is. There is a bit of pooling in the small of my back where the fabric hits my derrière but I'm OK with that. I like a looser fit around my torso...it hides a multiple of "squishy bits". On this make I decided to leave off the facing altogether and use a light pink fold-over elastic (FOE) to finish the neck and "arm hems"...cos I'm lazing and I also wasn't super keen on the facings last time. Attaching the FOE was, for some annoying reason, much more difficult than my last go at this dress. On top of that when I released the sleeves were too tight (especially on my right arm) I tried to unpick the FOE in order to reapply it. That was NOT fun as I'd been sewing it on with quite a small stitch length. Gah. I'm also not loving the way the neckline is sitting - it looks mega homemade to me...and not in a good "I'm a sewing genius kinda way". The fabric is quite thin and I agonized for DAYS over whether or not to line the dress (not that I know how to but I would've muddled through by making another dress from lining and just treating the lining/dress as one piece). Over the October long weekend I went to Canberra and met up with some of the Canberra Spoolettes...fabric sample in tow. I was told in no uncertain terms that the dress DOES NOT NEED LINING. Ok then...but I might pack a slip in my handbag as I feel the dress may be *just* a bit too see-through when the light hits it in the wrong way. The hem is done using a zig-zag stich as my machine eats twin-needles for breakfast. I used a bit of that iron-on stay tape stuff to get the hem nice and even, although I cheated and over locked it on to the fabric first before turning it under to iron on which is less faffing all round really. Update: sooo, since drafting this post I wore the dress for an ENTIRE day! Gasp! First I lay around on the couch watching Project Runway and Grey's Anatomy whilst eating toast and oranges. Later in the day I drove the car over to Spotlight in Castle Hill where I found MORE of this fabric for a do-over. Note to self: when shopping for a particular fabric probably best NOT to wear a dress made of said fabric as you will attract much too much attention in the fabric store (though this did garner me a few nice comments on my dress...my first even unsolicited comments on a me-made garment). Whilst the arms were tight, they weren't TOO bad...bearable if I had my mind on other things. The arms didn't prevent me from stuffing food into my face or driving the car. And as it was a really really hot day I couldn't have cared less if the fabric was see-through or not! So semi-win. Modificaitons: left off facing and finished neck/arms with fold-over elastic. Hem has been lengthened but about 5cm. Fabric: Polyester Elastane from Spotlight - purchased 2.1m and used most of it. Notions: Fold-over elastic from Tessuti in Surry Hills - purchased 2m and used most of it. Changes for next time: revert back to a neck-facing; increase size of arm-hole to less torturous proportions. Your pins are cute. Go and stand in front of the setting sun and let us see them. Looks fantastic Mel! Think i might get this pattern after your review, looks like a tops dress for summer. Was at Auburn Spotlight (the visit with my work pal) last week and they still had the hearts fabric if you want MORE!! The colours look great on you. I really like this on you and adore the contrasting tape sleeves and neck. I'm sorry if we led you down a see through path. 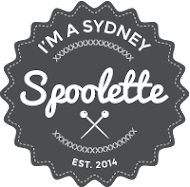 Clearly us Canberra spoolettes are just a little bit risqué. that is some darn cute fabric and very punny title! i geddit!. The fit is really good on you and I agree with your comments re; the drape and its flattering skills. And i commend you on your lounging and fabric buying skills in this dress. Hopefully one day comments will come naturally without you having to carry around a matching bolt of fabric. Totally a good idea actually! haha. Will you make the exact same one again or a different dress from the new fabric? it looks great and how awesome that you gave it another go after the first one, also having laughing fits at the thought of you wearing the fabric while buying the fabric! This totally works and even if the sleeves are too tight they certainly don't look it. PS - how good is Project Runway, it has to be one of my favourite shows even if the contestants are infuriating at times!! You Capital Ladies are all about flashing the pins...and knickers! Super sassy! LOL. The sleeves are probably not too tight for a "normal person"...but I am not ze normal person. In the worse of Tim Gunn though I'm going to make it work, baby (the baby is my bit, Tim would NEVER say that). I totally camouflaged into the fabric - I was just a head bobbing around on a bolt of heart fabric. I bought 2.5m of the new fabric...I'm sitting on it for now (not literally) in case something else pops up to inspire me. You Canberra ladies are tres naughty! When it's hot though who cares who can see my knickers...I was beyond caring by the time I got home as it was SO darn hot! I think you'd rock this pattern...and it's super quick to make up. I've got quite a bit more of heart fabric now from Castle Hill but thanks for keeping your eyes peeled for me! This is so cute! The cap sleeves are particularly adorable... hopefully they'll stretch out or something so you can get lots of wear out of this!